Cabinets are such convenient pieces of furniture to own. They provide storage for essentials and allow you to hide odd and ends when company is expected so that your house looks much tidier than it really is. As any savvy shopper would know, a well-made cabinet can be quite costly, and that’s excluding the price you pay to have a workman install it for you! What’s a frugal homemaker to do but learn how to build a cabinet of her own when she needs to cut back on spending? To make a cabinet that runs from floor to ceiling, you would need 8-feet tall sheets of wood. 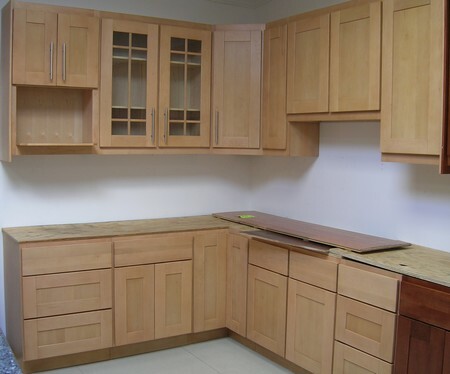 As cheap as it is, you should avoid using medium-density fiberboard (MDF) if you want your cabinet to last. Additionally, prolonged exposure to moisture can cause MDF to disintegrate and fall apart. Two of these tall, or long, depending on how you look at them, pieces of wood are cut to measure 8-feet tall and 2 feet deep to form the two sides of the cabinet. For the top and bottom sides of the cabinet, you should measure out wood pieces that are 5 feet long and 2 feet wide. Shelves should be fashioned with slightly smaller measurements so that they can be inserted without problem. You may cut brackets in to the side pieces or drill holes for shelf holders for easier installation. The shelves should be spaced about 18 inches apart to allow sufficient storage space. You will need cabinet doors to keep the contents of your cabinet where they belong. Mark out the spots on the cabinet where you want to attach the door hinges. Be sure to align them with the hinge locations on the doors themselves. Scoop out mortises where the hinges should be with a chisel, bevel side down. Turn the chisel bevel side up to smooth out the mortises before drilling the area where the hinge screws should go. 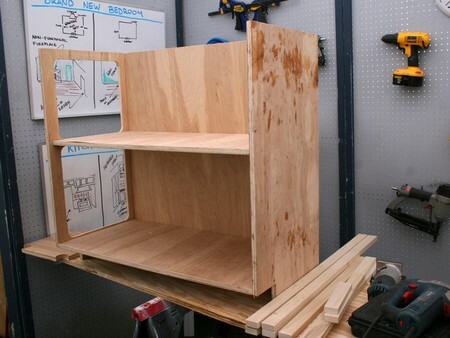 Attach the hinges and marvel at how easy it was learning how to build a cabinet with simple doors. To assemble the cabinet, connect the sides of the cabinet to the top and bottom pieces with wood screws and wood glue. Evenly distribute the number of wood screws used to ensure even weight-bearing loads. A good number of wood screws to use are 4 on each side. The top and bottom pieces of the cabinet should fit inside the sides of the cabinet so that the fasteners remain unseen. Don’t forget to attach the cabinet to the wall for stability. The cabinet can then be painted or stained to your liking, and sealed to prevent moisture damage.